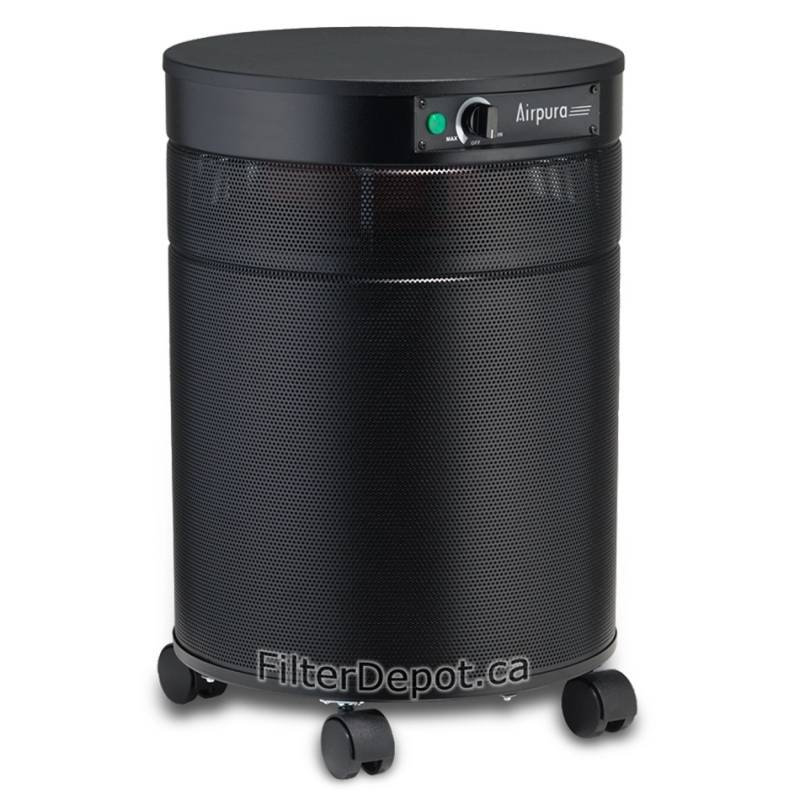 AirPura F600DLX employs the AirPura oversize filter canister filled with massive amount of AirPura F600DLX Industrial Strength Adsorbent for Heavy Duty Formaldehyde removal. 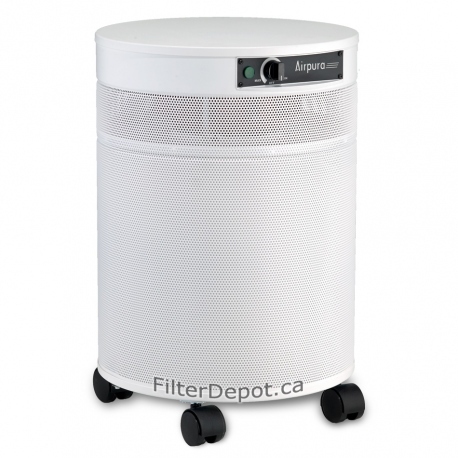 AirPura F600DLX is a Proprietary AirPura air purifier designed by AirPura for effective Heavy Duty Formaldehyde removal. AirPura F600DLX employs large amount of AirPura F600DLX industrial strength adsorbent in oversize canister, which allows the AirPura F600DLX to guarantee the most effective and speedy removal of Heavy Formaldehyde in wide variety of residential, institutional, commercial and industrial applications. AirPura F600DLX employs the oversize filter canister with industrial strength specialty adsorbent for a Heavy Duty Formaldehyde removal. 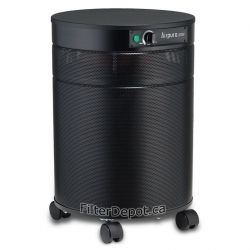 The AirPura F600DLX is powered by the energy efficient and quiet, compact one-piece motor/fan. AirPura F600DLX delivers a superior air flow of 560 CFM which makes it effective for areas up to 2000 sq. ft. The AirPura F600DLX variable speed control helps set up the optimal air flow in all operating conditions. 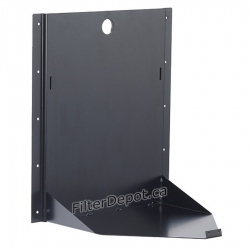 AirPura F600DLX employs non off-gassing the all metal housing with baked-on powder coat. The AirPura F600DLX produces no toxic off-gassing and no ozone making it an Environment Friendly air purifier. The AirPura F600DLX 5 / 10 Year manufacturer's warranty gives the users a peace of mind. The AirPura F600DLX ships Free by Ground service in continental US and Canada. There are No US Sales Tax and No Border fees on AirPura F600DLX purchases. AirPura F600DLX comes with a 30-Day Money Back Satisfaction guarantee Return policy (some conditions apply). AirPura F600DLX - When to Use ? AirPura F600DLX Heavy Duty Formaldehyde air purifier is specialty AirPura air purifier designed to provide an effective solution in dealing with extreme levels of formaldehyde. 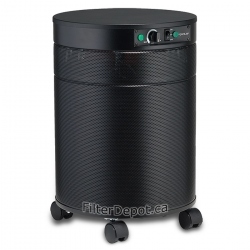 Oversize 3-inch deep activated carbon filter canister with Formaldehyde adsorbent. What sets the AirPura F600DLX apart from other AirPura models is the massive amount (26 lbs.) of industrial strength specialty adsorbent in a 3-inch deep oversize canister. To ensure that AirPura F600DLX is up for a job, up to 35% of activated carbon is replaced with special additives, including Potassium Permanganate. This allows to significantly increase the adsorption capacity of AirPura F600DLX in removal of Formaldehyde, VOCs and other specific chemicals in very high concentrations. Not recommended for individuals with MCS (Multiple Chemical Sensitivity). 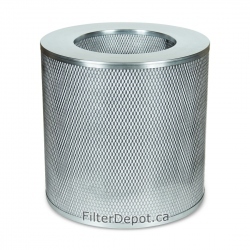 The AirPura F600DLX oversize 3-inch deep carbon filter canister doesn't leave enough room for placement of a standard size True HEPA filter. 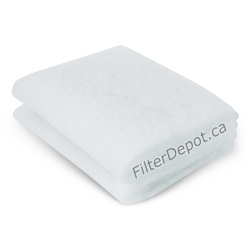 Therefore, the HEPA-type filter barrier is used instead to provide an adequate filtration of the air from most common allergens and dust. 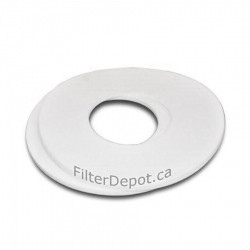 Standard Polyester based Pre-filter (the first stage of the air filtration system) traps most of large visible dust and dirt particles, while providing protection to fine true HEPA filter from faster contamination and extending its lifetime. The optional unbleached pesticide-free Cotton pre-filter is available for concerned air purifier users. AirPura F600DLX is equipped with the same powerful, yet energy efficient backward impeller Motor/Fan assembly with variable speed control rated at 560 CFM. The AirPura F600DLX variable speed control allows users to select the speed setting that is the most suitable for any particular air cleaning application, activity or a time of the day. The motor and electric components are placed in a separate chamber to eliminate the contact with the already filtered air to prevent its re-contamination. The AirPura F600DLX unit can be equipped with optional motor and power cord for use with 220-240 Volts, 50 Hz power supply per customer's specification at Extra cost. AirPura F600DLX features the AirPura unified the all metal housing - durable and impact resistant. The appliance quality baked-on powder coating resists scratching, scuffing and stain. 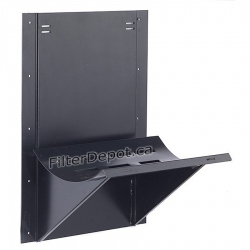 The 320° Clean air outlet at the top deck of the unit ensures even clean air distribution. Clean air outlet in the upper deck of the unit is away from dust and dirt on the floor. AirPura F600DLX air purifier comes with the most comprehensive limited manufacturer's warranty. The Total duration of Limited Manufacturer's Warranty - 10 Years.